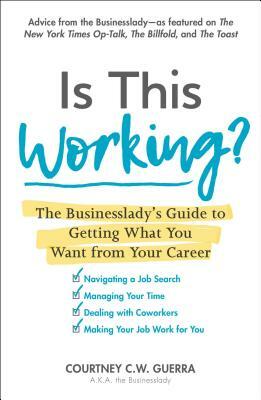 From the creator of the Dear Businesslady column comes a fresh, proactive book with advice for women entering the workforce as well as those looking to move up the ladder. Courtney Guerra, a.k.a. The Businesslady, knows how to set you on the path where you belong. In a fun-to-read Q&A format, this book focuses on situations young people are likely to encounter in the workplace, along with a set of strategies you can use to get through them. In her signature tone that has gained her hundreds of thousands of readers, Guerra discusses topics relevant to young professionals, like how to make the jump from “just a job” to a career in line with what you went to school for, and how to stay productive when working from home at an apartment filled with distractions. No matter what the scenario, The Businesslady has the answer to get you on the path to long-term career success. Courtney C.W. Guerra has been writing her Dear Businesslady column since 2014, first on The Toast and now on the financial advice site The Billfold. Starting out with experience in food service, retail, and data entry—plus a joint BA in English and visual arts—she proceeded to build her resume through a series of administrative positions, both corporate and nonprofit. She’s spent most of her career as a writer and editor supporting humanities research at the University of Chicago. "Is This Working? is like your mom at the door before you left for school. Full of reminders and reality checks. It’s an easy-reading and worthwhile collection of tips to help get you and keep you on track to your career goals."